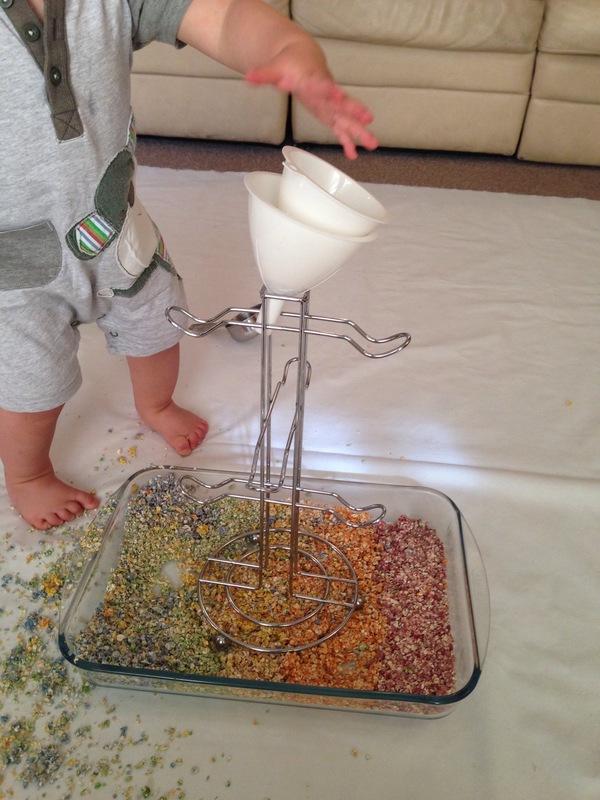 If you’ve been following the blog recently you will have probably noticed that we have been practising lots of scooping activities to help Buddy to develop spoon control. This week, we decided to roll out another. 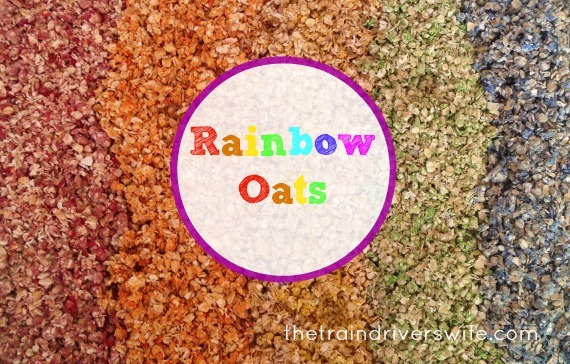 I love these Rainbow Oats. They are really easy to make and they look fantastic. They are also super cheap and taste safe – that’s a win all round as far as I’m concerned! This play was inspired by And Next comes L who also provided the tutorial for dying oats. You can read it on the following link. 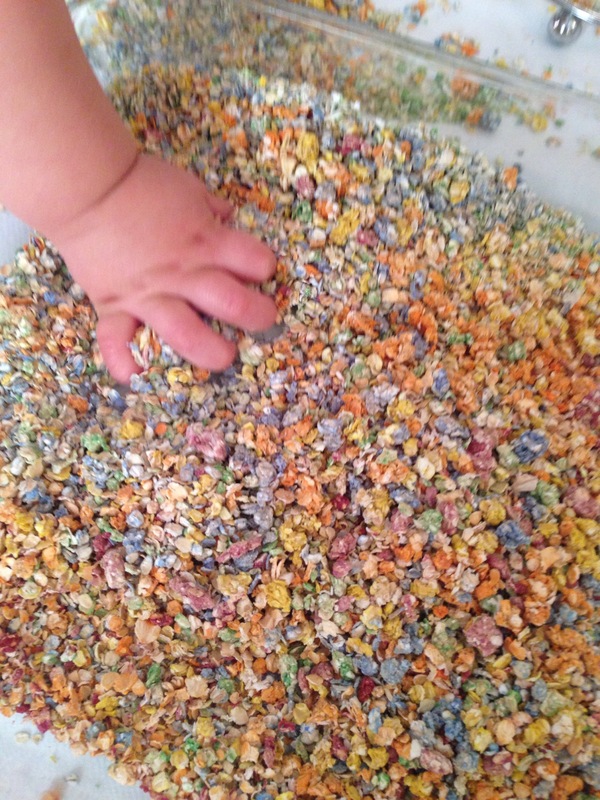 We used food colouring to dye our oats because Buddy is still a munch happy explorer. The colour is not as vibrant as that achieved with liquid water colours, however it is a great alternative for taste happy kids! I used our mug tree and some funnels to create a scooping target for Buddy. We also gave him a choice of measuring cups, a spade and a serving spoon to scoop with. Buddy was intrigued by the porridge oats and, like always, he was eager to run his hands through it. 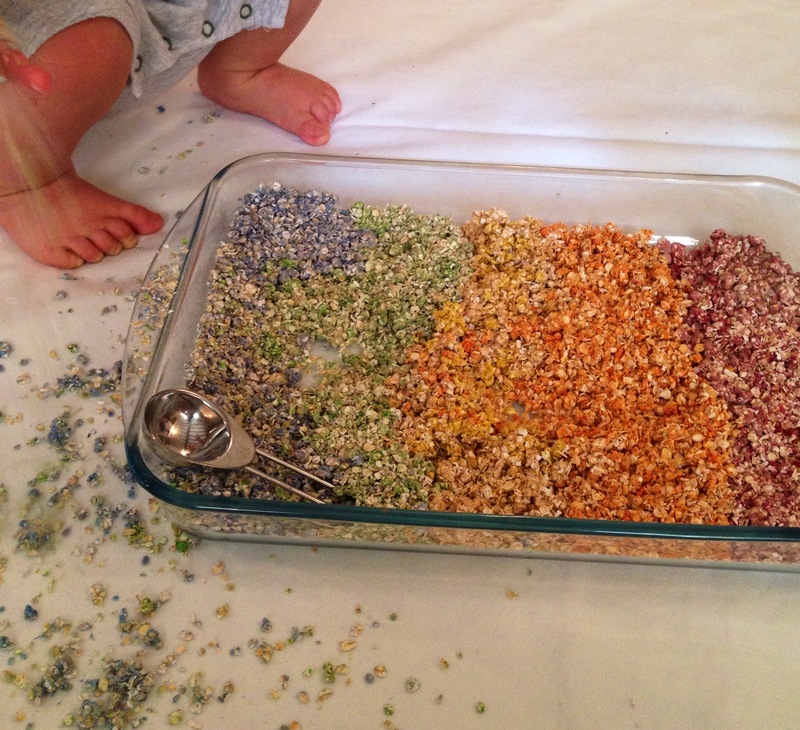 His first mission was clearly to spread the rainbow happiness all over the mat! 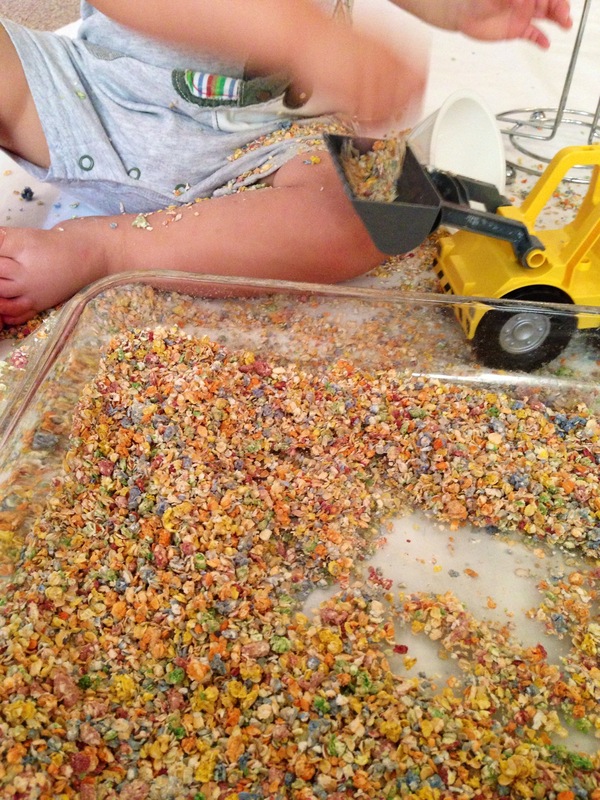 He enjoyed the texture of the oats and was ecstatic letting them drizzle from his fingers. 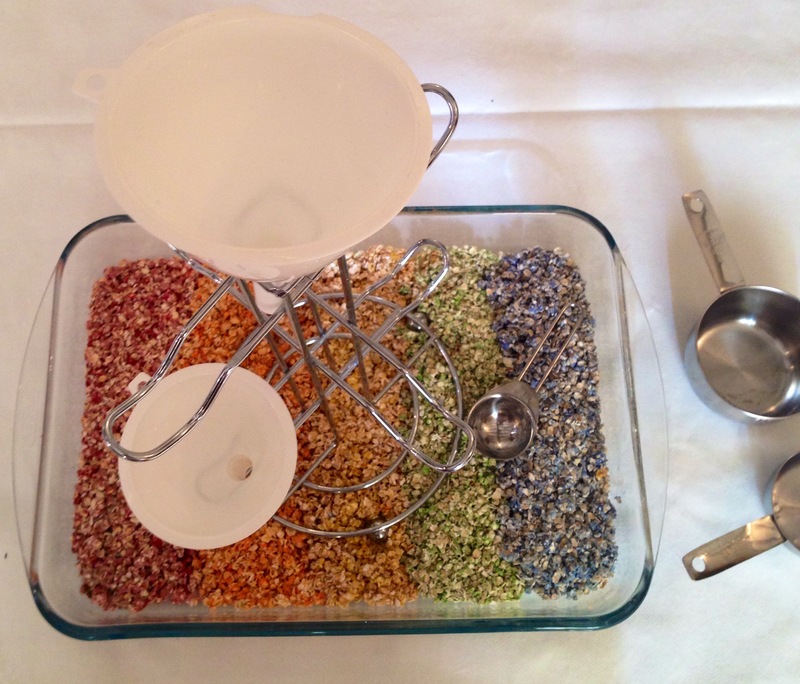 He also loved swirling the oats and mixing the colours together. 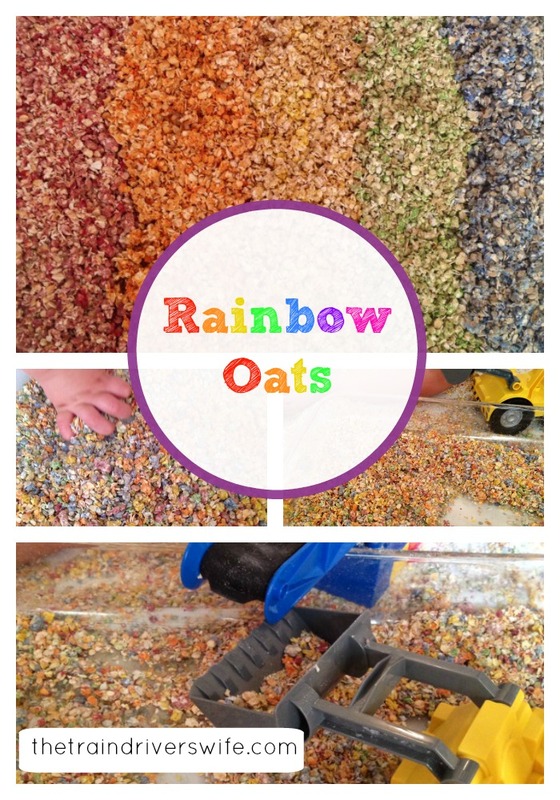 We played with these oats for over an hour. Buddy sought out his digger and had a great time digging the oats and dumping them on the floor. We even pulled out our Duplo conveyor belt and hopper. Buddy loved dropping the oats onto the conveyor belt and watching it drop into the bulldozer. Although we didn’t practice scooping, as I had initially planned, we worked on so many other skills – grabbing, sweeping and dropping. 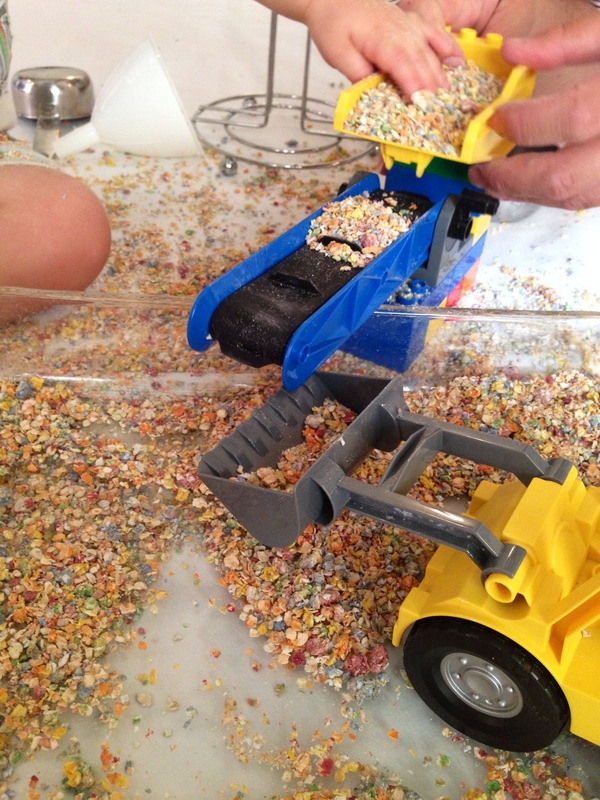 He also did a great job at imaginary play with his duplo and problem solving too, sweeping the oats out of the hopper onto the conveyor to fill the digger. This play is so open ended. 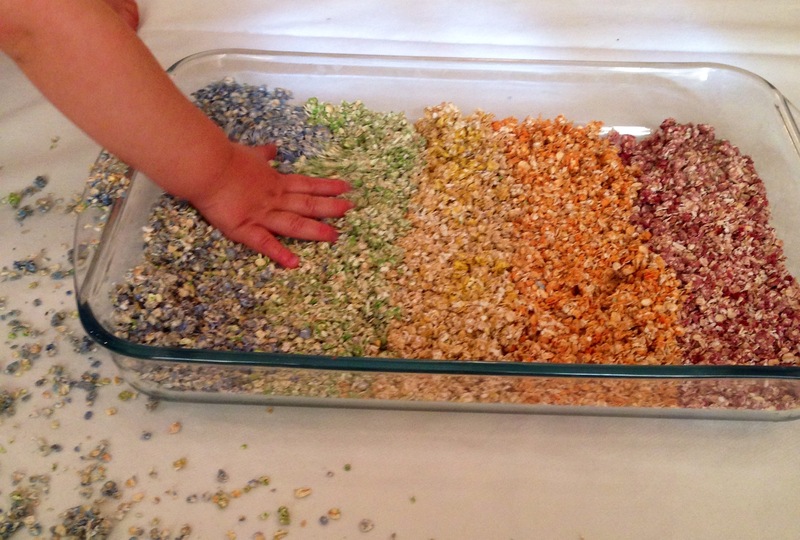 There are so many options for imaginary play, small worlds and fine motor skill building too. It is honestly one of our favourites so far! I hope you have enjoyed this play and would love to hear from you! Comment below to share your thoughts and experiences. Oh my goodness what a fun mess that was made. Never tried to dye oats so thank you for this.